Faith Shattered and Restored is the first authoritative attempt to introduce the English-speaking public to one of Israel’s most creative and influential thinkers. These seminal essays set out a new path for preserving and cultivating Jewish spirituality in the twenty-first century and beyond. Edited by Rabbi Dr. Zohar Maor, Translated by Elie Leshem. 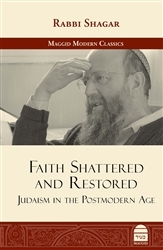 With a preface by Aryeh Rubin and an afterword by Rabbi Shalom Carmy.